For other people with the same name, see Zechariah (disambiguation). Zechariah (/zɛkəˈraɪ.ə/; Hebrew: זְכַרְיָה, Modern Zekharya, Tiberian Zəḵaryā, "YHWH has remembered"; Arabic: زكريّا‎‎ Zakariya' or Zakkariya; Greek: Ζαχαρίας Zakharias; Latin: Zacharias) was a person in the Hebrew Bible and traditionally considered the author of the Book of Zechariah, the eleventh of the Twelve Minor Prophets. 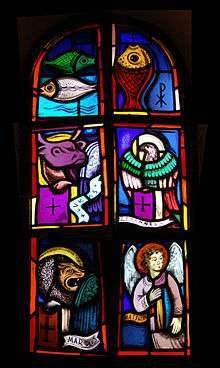 He was a prophet of the two-tribe Kingdom of Judah, and, like the prophet Ezekiel, was of priestly extraction. This discrepancy is best explained on the supposition that the words 'the son of Berechiah' did not form part of the original text of 1:1 - had they done so, it is very improbable that they would have been omitted in the Ezra passages - but that they are an insertion on the part of someone who identified the prophet Zechariah with Zechariah the son of Jeberechiah, who is mentioned in Isaiah 8:2, Berechiah in Zech. 1:1 being a corruption of Jeberechiah. Another explanation might be that 'father' is used in a broader sense, meaning that Iddo was Zechariah's father in the sense that he was antecedent to him. His prophetical career began in the second year of Darius, king of Persia (520 BC), about sixteen years after the return of the first company from their Babylonian exile. According to the Book of Ezra he was contemporary with Haggai. After the deaths of Haggai, Malachi, and the subject, the Holy Spirit left the people of Israel according to the Aggadah source,"Yoma, 96". Not much is known about Zechariah’s life other than what may be inferred from the book. It has been speculated that Iddo was the head of a priestly family who returned with Zerubbabel (Nehemiah 12:4), and that Zechariah may himself have been a priest as well as a prophet. This is supported by Zechariah's interest in the Temple and the priesthood, and from Iddo's preaching in the Books of Chronicles. In the Gospel of Matthew, Jesus is quoted as stating that Zechariah son of Barachiah was killed between the altar and the temple: "that upon you may come all the righteous blood shed on the earth, from the blood of Abel the righteous unto the blood of Zachariah son of Barachiah, whom ye slew between the sanctuary and the altar." A similar quotation is also found in the Gospel of Luke: "from the blood of Abel unto the blood of Zachariah, who perished between the altar and the sanctuary: yea, I say unto you, it shall be required of this generation." Although there is an indication in Targum Lamentations that "Zechariah son of Iddo" was killed in the Temple,  scholars generally understand this as a reference to the death of a much earlier figure, Zechariah ben Jehoiada. As Abel was the first prophetic figure killed in the Hebrew Scriptures, and Zechariah ben Jehoiada was the last figure killed in those scriptures,  which conclude with 1 and 2 Chronicles, they represent the full historical scope of prophetic martyrdom. By using their names, Jesus brings to bear on the Jewish establishment of his day the cumulative guilt for killing those prophets, to which within a few days (in Matthew's chronology) they would add his own death. The logic of the accusation means that the reference is almost certainly to Zechariah ben Jehoiada. Bahá'í teachers have made comparisons between the prophecies of Zechariah and the Súriy-i-Haykal in the Summons of the Lord of Hosts, a collection of the Tablets of Bahá’u’lláh. The Qur'an mentions only 25 prophets by name, including a different Zechariah, the father of John the Baptist. Muslims believe that many prophets were sent to mankind to spread the message of God, including many not mentioned in the Qur'an. Therefore, although this particular Zechariah is not mentioned by name in the Qur'an, some scholars, including Abdullah Yusuf Ali have suggested that Qur'anic verses mentioning the martyrdom of prophets and righteous men are a reference to the slaying of, among others, Zechariah son of Berechiah. On the Eastern Orthodox liturgical calendar, his feast day is February 8. He is commemorated with the other Minor Prophets in the calendar of saints of the Armenian Apostolic Church on July 31. Wikimedia Commons has media related to Zechariah (6 c. BC). This article incorporates text from a publication now in the public domain: Easton, Matthew George (1897). 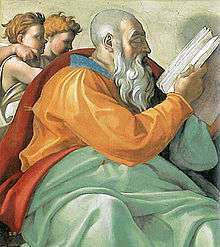 "Zechariah". Easton's Bible Dictionary (New and revised ed.). T. Nelson and Sons. ↑ Editor. (1972) "Zechariah". In Encyclopaedia Judaica. 16. Jerusalem:Macmillan, p. 958. ↑ Targum on Lam 2:20: "Is it right to kill priest and prophet in the Temple of the Lord, as when you killed Zechariah son of Iddo, the High Priest and faithful prophet in the Temple of the Lord on the Day of Atonement because he told you not to do evil before the Lord?" Cited with permission from English translation by C.M.M. Brady at http://www.targum.info/meg/tglam.htm. ↑ Brady, 1999, “Targum Lamentations’ Reading of the Book of Lamentations” (1MB pdf), page 116.